Although the most common fingernail problems may include painful hangnails or splitting and cracking nail beds, several underlying medical conditions (some serious) may present themselves in the form of seemingly innocent fingernail issues. General nail care and maintenance can help you identify and treat various health conditions. The study of the nails is referred to as onichognomy. Often an indicator of the overall body health, the nail bed and the nail condition can reflect the performance of the internal organs and any body/vitamin deficiencies. When caring for your health, it's important to identify nail disorders and seek medical counsel to properly diagnose any underlying medical diseases or conditions. Vertical nail splitting: This is a very common condition which may be associated with aging. Brittle nails: Brittle nails are a common nail condition and may indicate vitamin, calcium and/or iron deficiency. This condition may also indicate overexposure to chemical solvents and/or water. 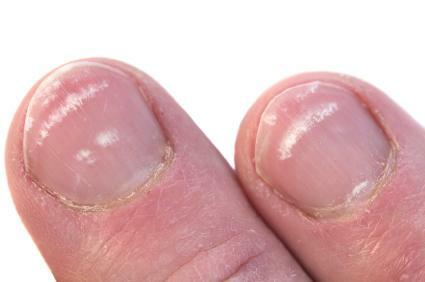 Pitted nails: Pitted nails may be associated with psoriasis, alopecia areata, or eczema. Blue nails: Blue nails may be an indication of circulation problems, or pulmonary conditions such as asthma. White spots (Leuconychia): These are common with those suffering from a zinc deficiency. These can also be seen in serious conditions like sickle cell anemia and Hodgkin's disease and can occasionally be hereditary and may disappear over time. Flat nails: Flat nails could be possible indicators of a thyroid condition, Vitamin B12 deficiency, or anemia. Yellowed nails: This problem could have several causes, such as diabetes, or a lymphatic system disorder. Horizontal ridges: These ridges could be an indication of malnutrition or anemia. Beau's Lines: This is another type of horizontal ridge on the nail. These dark, horizontal depressions on the nail may be caused by anything from trauma or illness to malnutrition or chemotherapy. Metabolic conditions may also be to blame. Infections surrounding the nail bed: A common infection is paronychia. Terry's nails: In Terry's nails, the tip of each nail has a dark band; this may be associated with liver disease or congestive heart disease. Pterygium Inversum Ungius: This condition causes the hyponychium (the soft skin that lies directly under the free edge of the nail) to grow forward with the fingernail. It can be systemic or hereditary, or it could stem from an allergic reaction to acrylics or chemicals. Pterygium: Pterygium occurs when the skin behind the cuticle begins to advance over the nail plate. This is usually the result of trauma due to surgery or cuts to the nail plate. For more information about nail disorders, please check the Academy of Dermatology website or the New Zealand Dermatology Society Incorporated website. Many general nail disorders can be linked to bacteria growth, and skin infections such as staph and fungal viruses. Taking good care of your nails can help you avoid some of these nail problems. To maintain the integrity and health of your nails, take proper care of them. The following tips will keep your nails in a healthy state and may prevent future nail problems. Keep the nail bed clean and dry. Thoroughly pat dry toenails after every shower or bath to avoid fungal infection. If you're a nail biter, stop. Nail biting spreads germs and can infect the nail bed. If you need help with quitting, seek a physician's care for specialty treatment. Keep cuticles moisturized daily with a cuticle oil containing vitamin E.
Avoid acetone nail polish removers. To prevent ingrown toenails, always file nails straight across, rather than curving or ovaling the free edge. While artificial nails add instant appeal for those seeking length, wearing artificial nails can be damaging to the nail bed long term, and quite expensive. They can also increase your risk for an infection. You can keep nails short and trim and looking great with regular manicures of your natural nails. If you do wear artificial nails, make sure you have regular manicures with replacement of the artifical nails as needed. In addition, nail implements should be sanitized before each and every use to prevent viral and Staph infections. If you frequent nail salons, you may consider purchasing your own nail implements to ensure the safety and cleanliness of your visit. While underlying medical conditions require professional treatment, common fingernail problems may be treatable with proper diet and exercise. Drink the recommended eight glasses per day of water to help hair and nails grow healthy and strong. Eat a balanced diet. Nails are made up of keratin, so protein and calcium are essential to grow and maintain healthy nails. Exercise increases the circulation of the blood, thus the growth of the nails. Keep your body in shape and exercise daily for healthy nails and skin. Add a B-complex supplement to your regimen (many nail problems are related to vitamin B deficiencies). Indulge in fatty acids (good sources include nuts, vegetables, eggs, whole milk and flaxseed oil supplements). Many people strive to grow long healthy nails. Fingernail issues are common nuisances that can often be treated at home with change of diet and daily nail care. A family physician is able to treat most fingernail conditions. If your physician is unable to treat underlying health issues or perform surgery, you will be referred to a specialist for ongoing treatment. Those experiencing health problems on the toenails may seek the treatment from a podiatrist for specialty care. Many nail conditions can quickly become infected, so it's important that you seek immediate counsel if you have a fingernail or toenail that is red, painful or swollen on the edges. In addition, any condition accompanied by oozing or bleeding should be considered serious.